If you're looking for a perfectly wonderful eco-friendly gift for your child, Artterro Arts & Crafts Kits can't be beat. The best thing about Artterro art kits is that they offer open-ended craft play that allows your child to use his imagination versus simply following art kit directions. Additionally, every single Artterro art kit is sustainable, fairly made and seriously affordable. 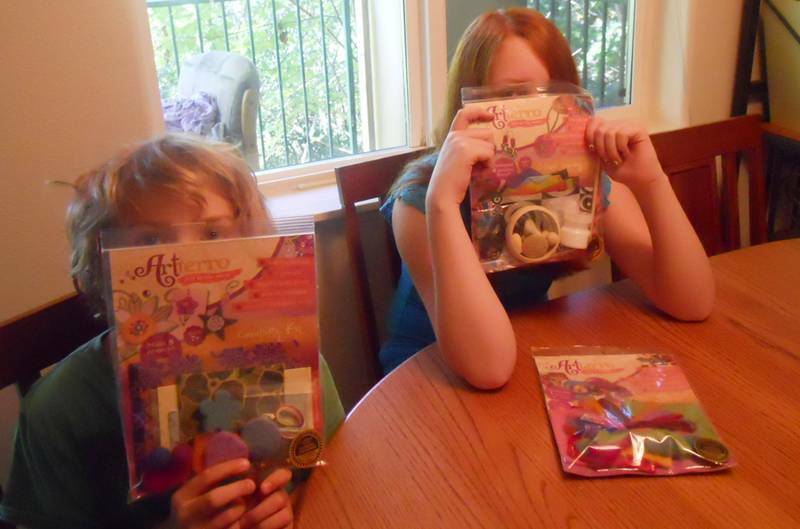 My kids were lucky enough to get to test out three amazing Artterro Arts & Crafts Kits. Keep reading to see what we thought of these all-in-one craft kits and to learn more about the eco-perks of both the kits and the company who makes them. Safe and sustainable: Artterro uses safe and high-quality natural materials in their kits, such as 100% wool felt, 100% post-consumer waste decorative handmade paper, glass and wooden beads, cotton thread, hand batiked cotton fabric and copper wire. 100% sustainable packaging: Each Artterro box is not only made with easily recycled materials, but each kit comes with a bonus project as the box can be re-purposed into a frame for your child’s finished artwork. Imaginative: Each kit comes with a full set of instruction sheets that are easy to understand. However, the best part is that the instructions don’t mandate a finished product. Your child uses the instructions to learn, say how to use decoupage paper, but then comes up with the finished idea all on his own. Very creative and open-ended play is the result. Green retailing: Artterro’s retail display units for stores are made from 100% renewable bamboo. Green printing: All of Artterro’s packaging inserts and marketing materials are printed on recycled paper (most of it 100% PCW) using vegetable based inks and renewable energy. Giving back: To help create jobs, Artterro kits are assembled at and shipped from the non-profit Goodwill Industries in Milwaukee, WI. Additionally, Artterro has donated kits to Project Kids in Cambodia. The Collage Jewelry Kit comes with everything your child needs to create 6 unique jewelry pieces. 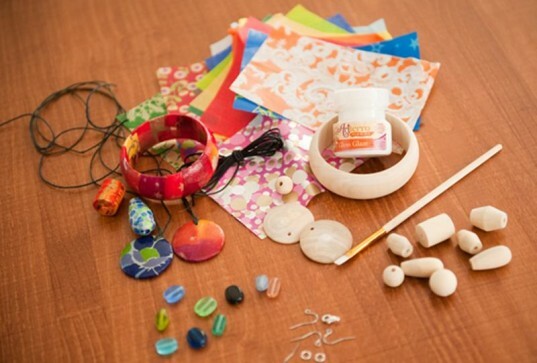 Materials include fun supplies such as beautiful decoupage papers, wooden jewelry elements such as a bangle, beads and pendants, plus tools like twine, glaze, brush, findings and an idea sheet. My son Cedar showed some interest in the Collage Jewelry Kit, so I wouldn’t say it’s a ‘girls only kit.’ However, my partner’s daughter Katana spent more time than Cedar playing and crafting with this kit. So, in my house anyway, the kit had more girl appeal. With very little help from me, Katana learned how to use the decoupage papers and glaze quickly to make many cool pieces of jewelry. Cedar decided to mix and match elements of this kit with the Artterro Creativity Kit to make a mask ornament and some other cool projects. In the end, the kids made some surprisingly ‘professional’ looking jewelry with this kit and gave it a thumbs up. The Creativity Kit was our least favorite of all the three kits we sampled. However, that doesn’t make it a bad kit. Our house is simply jam packed with basic art supplies as it is, so the types of materials offered in this kit were already all over our house. Now, on the flip-side, if your child has few art supplies or is just getting old enough for crafts, then this would be a great kit choice. The Creativity Kit comes with plenty of materials that allow for total freedom of creativity. Included are fancy handmade papers, beads, wool felt shapes, needles and thread and more. Your child can come up with his own idea for a project or use this kit to make the suggested greeting cards, bookmarks, ornaments, gift tags, small sculptures and more. In all, this art kit has enough supplies for about eight projects. Hands down the Paint With Wool Portrait Kit was the house favorite. Every single person in the house – three kids and two adults tried it out and LOVED it. None of us had ever done wool needle felting, and this kit was a super fun introduction to it. The kit comes with enough materials to make four 4-inch pieces of art. If you’re unfamiliar with wool felting, how it works is you poke colorful bits of roving wool bits into the base felt shape with a felting needle. The wool can be used to paint pictures of just about anything you can imagine. No glue or sewing required. Jade, the oldest kid in our house, had a pretty easy time learning to do this. The younger kids took a little longer to catch on, but once they did, they had a great time. Due to the very sharp needle and the learning curve, I suggest that only kids 8 or older use this, and even then, having an adult around is a good plan. Overall, this kit was the biggest hit with everyone, and we’d highly suggest it. In fact, this kit inspired the kids and now they’re interested in more advanced wool felting projects. *SAFETY TIP: At one point or another each of us accidentally poked our finger with the needle, so be careful! What other kits are available? 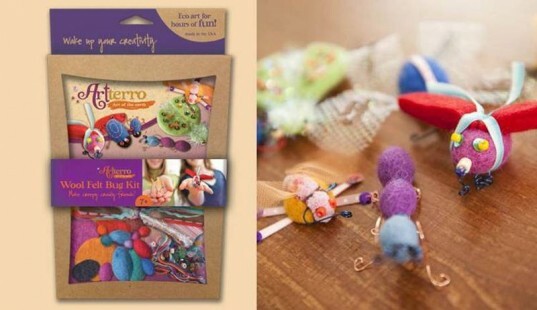 There are tons of fun arts and craft kits available at Artterro, such as the awesome looking Bubble Wand Kit, the Bookmaking Kit, and the brand new Wool Felt Bugs Kit shown above. In all there are currently a dozen amazing art kits available, all of them offering a taste of something new and creative for your child. While each kit already offers stand-alone fun, keep in mind that all the kits come with materials that can be mix and matched for even more projects. Best of all, these kits are incredibly affordable considering how eco-friendly they are, which makes them the perfect birthday or holiday gift for your child’s friends too. You can purchase Artterro Art Kits online or find a store near you that carries them. Images courtesy of Artterro & Jennifer Chait. Safe and sustainable: Artterro uses safe and high-quality natural materials in their kits, such as 100% wool felt, 100% post-consumer waste decorative handmade paper, glass and wooden beads, cotton thread, hand batiked cotton fabric and copper wire. 100% sustainable packaging: Each Artterro box is not only made with easily recycled materials, but each kit comes with a bonus project as the box can be re-purposed into a frame for your child's finished artwork. Imaginative: Each kit comes with a full set of instruction sheets that are easy to understand. However, the best part is that the instructions don't mandate a finished product. Your child uses the instructions to learn, say how to use decoupage paper, but then comes up with the finished idea all on his own. Very creative and open-ended play is the result. Green retailing: Artterro's retail display units for stores are made from 100% renewable bamboo. Green printing: All of Artterro's packaging inserts and marketing materials are printed on recycled paper (most of it 100% PCW) using vegetable based inks and renewable energy. Giving back: To help create jobs, Artterro kits are assembled at and shipped from the non-profit Goodwill Industries in Milwaukee, WI. Additionally, Artterro has donated kits to Project Kids in Cambodia. The Collage Jewelry Kit comes with everything your child needs to create 6 unique jewelry pieces. Materials include fun supplies such as beautiful decoupage papers, wooden jewelry elements such as a bangle, beads and pendants, plus tools like twine, glaze, brush, findings and an idea sheet. My son Cedar showed some interest in the Collage Jewelry Kit, so I wouldn't say it's a 'girls only kit.' However, my partner's daughter Katana spent more time than Cedar playing and crafting with this kit. So, in my house anyway, the kit had more girl appeal. 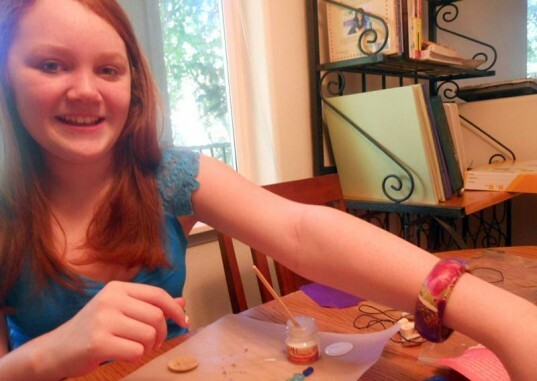 With very little help from me, Katana learned how to use the decoupage papers and glaze quickly to make many cool pieces of jewelry. Cedar decided to mix and match elements of this kit with the Artterro Creativity Kit to make a mask ornament and some other cool projects. In the end, the kids made some surprisingly 'professional' looking jewelry with this kit and gave it a thumbs up. The Creativity Kit was our least favorite of all the three kits we sampled. However, that doesn't make it a bad kit. Our house is simply jam packed with basic art supplies as it is, so the types of materials offered in this kit were already all over our house. Now, on the flip-side, if your child has few art supplies or is just getting old enough for crafts, then this would be a great kit choice. The Creativity Kit comes with plenty of materials that allow for total freedom of creativity. 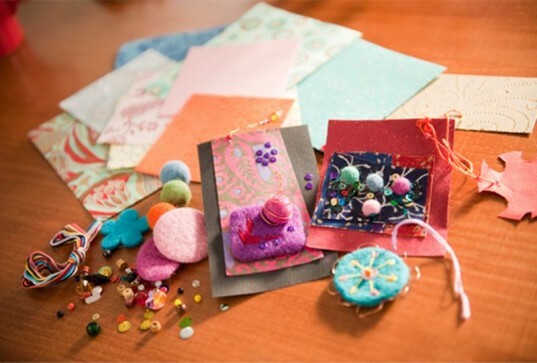 Included are fancy handmade papers, beads, wool felt shapes, needles and thread and more. Your child can come up with his own idea for a project or use this kit to make the suggested greeting cards, bookmarks, ornaments, gift tags, small sculptures and more. In all, this art kit has enough supplies for about eight projects. Hands down the Paint With Wool Portrait Kit was the house favorite. Every single person in the house - three kids and two adults tried it out and LOVED it. None of us had ever done wool needle felting, and this kit was a super fun introduction to it. The kit comes with enough materials to make four 4-inch pieces of art. If you're unfamiliar with wool felting, how it works is you poke colorful bits of roving wool bits into the base felt shape with a felting needle. The wool can be used to paint pictures of just about anything you can imagine. No glue or sewing required. Jade, the oldest kid in our house, had a pretty easy time learning to do this. The younger kids took a little longer to catch on, but once they did, they had a great time. Due to the very sharp needle and the learning curve, I suggest that only kids 8 or older use this, and even then, having an adult around is a good plan. Overall, this kit was the biggest hit with everyone, and we'd highly suggest it. In fact, this kit inspired the kids and now they're interested in more advanced wool felting projects. There are tons of fun arts and craft kits available at Artterro, such as the awesome looking Bubble Wand Kit, the Bookmaking Kit, and the brand new Wool Felt Bugs Kit shown above. In all there are currently a dozen amazing art kits available, all of them offering a taste of something new and creative for your child. While each kit already offers stand-alone fun, keep in mind that all the kits come with materials that can be mix and matched for even more projects. Best of all, these kits are incredibly affordable considering how eco-friendly they are, which makes them the perfect birthday or holiday gift for your child's friends too. Creations the kids worked on with the Paint With Wool Portrait Kit. Various Artterro art kit projects the kids made - a mask decoration, a colorful bead and a bird necklace. Katana’s bracelet made with the Artterro Collage Jewelry kit. Artterro easy to follow, but open-ended instructions.